Only 13h 7m 43s left! Lousy title for this post, but gives you an idea of what I am going to write about. 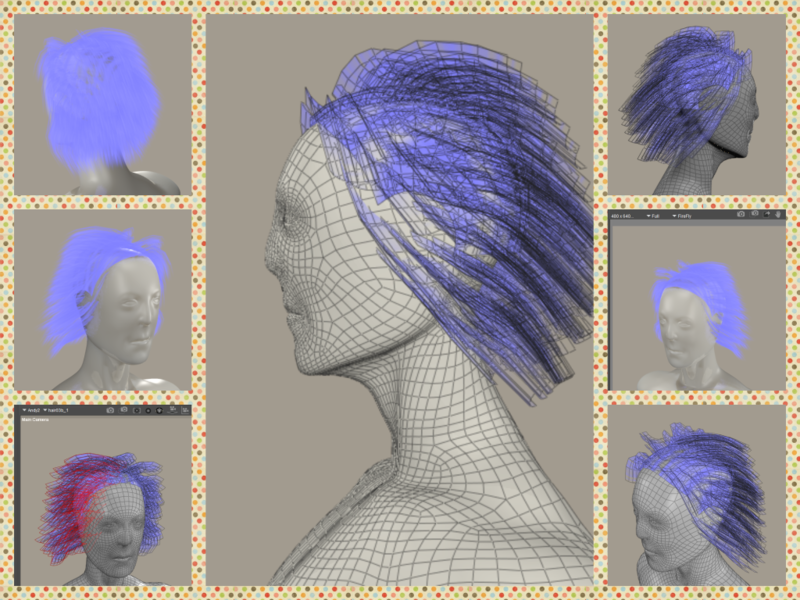 So I found out that besides being capable of generating fibre hair, Blender 3D can also convert that into geometric mesh, and with a bit of editing, those strands can be made into flat strips and exported for use as hair geometry inside Poser. 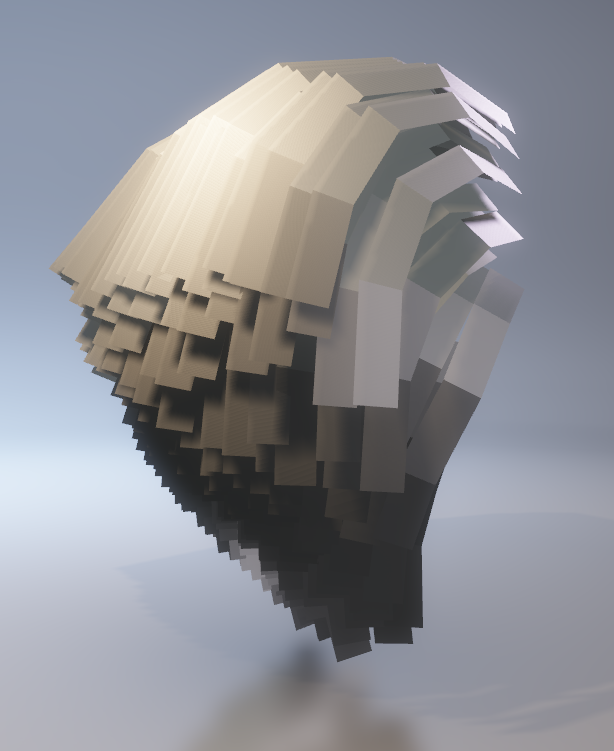 I am just beginning to learn how to do this in Blender 2.78c. I am using Poser Pro 11. Here is what the mesh looks like from various angles, as viewed with the Windows 10 View 3D app. I am now trying to work out a suitable shader set for Poser Pro 11, probably for the Cycles engine SuperFly, but no reason why a Firefly shader would not work either. 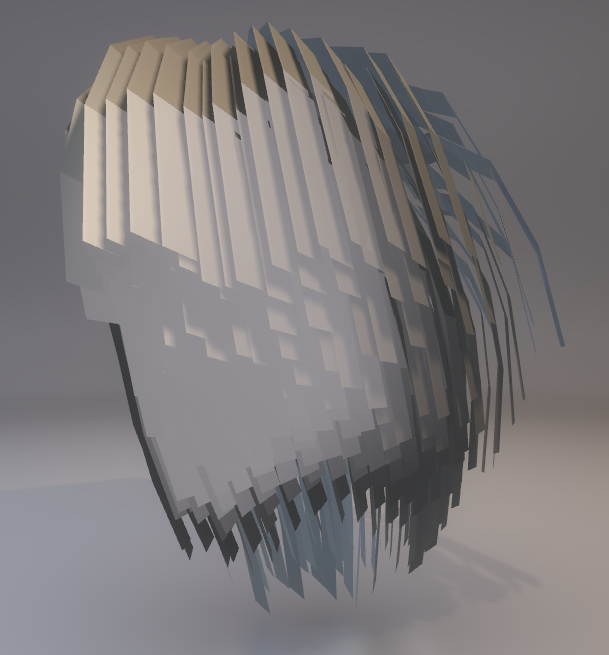 I used Blender 3D Particle Emitter Hair Option to generate fibre hair, then converted it into a geometric mesh, exported as OBJ, then positioned inside Poser Pro 11 as a 3D mesh hair prop. I found that I also needed a skull cap, so I generated a human figure using MakeHuman, edited the mesh in Shade3D (because it's faster for me to do it in this software), and exported the skullcap geometry as an OBJ file. 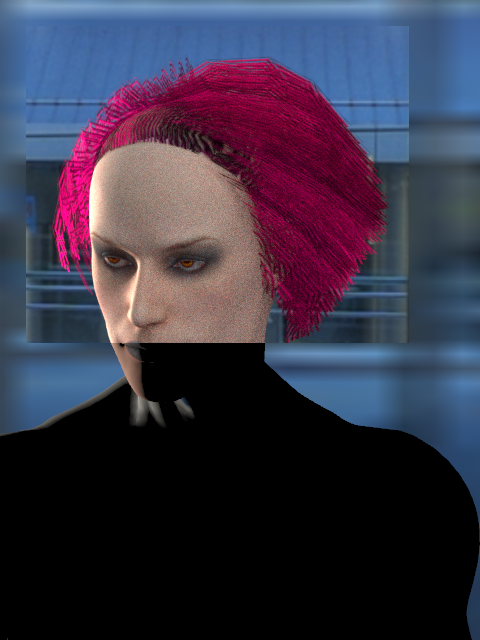 I imported that into Poser Pro 11 and set it up as the skullcap to go with the hair prop. Figure Model is Andy PP11. 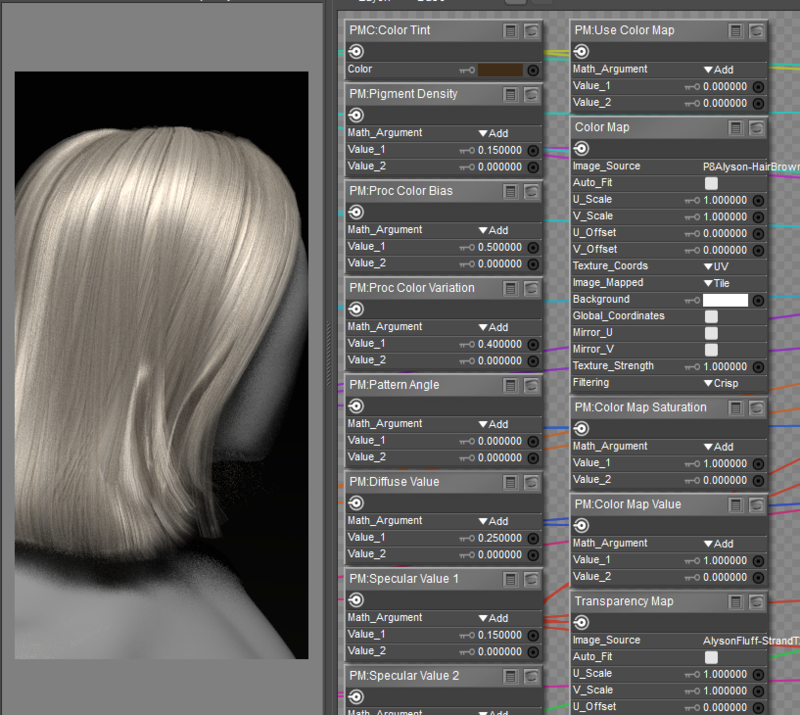 And here is a partial WIP of the first hair mesh I showed earlier in this thread. I also flipped the geometry inside Blender 3D, to give myself more options. So as you can see, I am not using long tubes of fibre mesh hair, but rather flat strips of geometry. I have cross-posted this to my own gallery at DeviantArt. Is the UV usable at all? Could it be used to drive root and tip colour or maybe you have already a way to do this procedurally. This is interesting. I already have published a superfly hair shader that makes procedural strands with lots of auto-coloring options, or it can use a color map texture. Either way, though, it relies on UV mapping, assumes the UV mapping on the strands is unidirectional, and that there is a transparency map for the hair prop that is not procedural, but fixed. The fixed trans map is something we could change, but it's not much of a problem IMO. So - if you could get those strips to be UV mapped into vertical stripes on the virtual UV space, you could almost directly use the shader I made. Once you get there, scroll down to the post where I say "OK here it is"
On page 11, vilters showed how he added a procedural transparency map, thus removing any need for texture maps. Thank you so much for adding your comments to this post, @bagginsbill ! I shall study the shaders you devised and try to work them on the mesh. Very grateful. 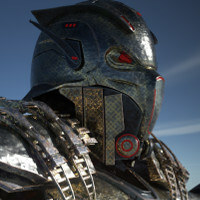 @ironsoul - Yes, the UVs are strips, not fibres. OK. 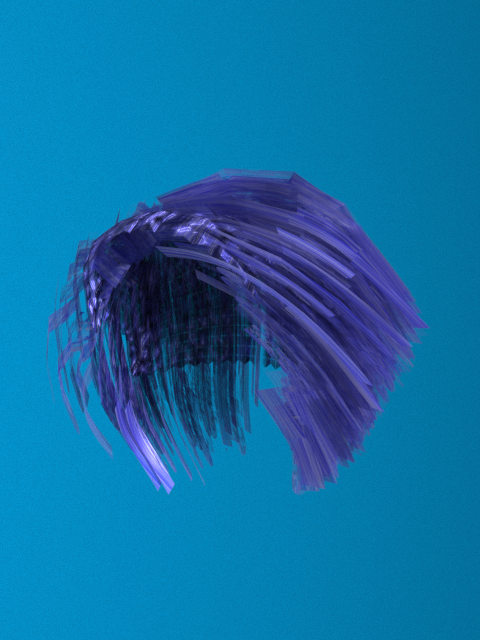 Here is a SuperFly low-resolution render of my Blender hair using BB's Hair python with SnarlyGribbly's EZskin3. Please note this is a very coarse test render. 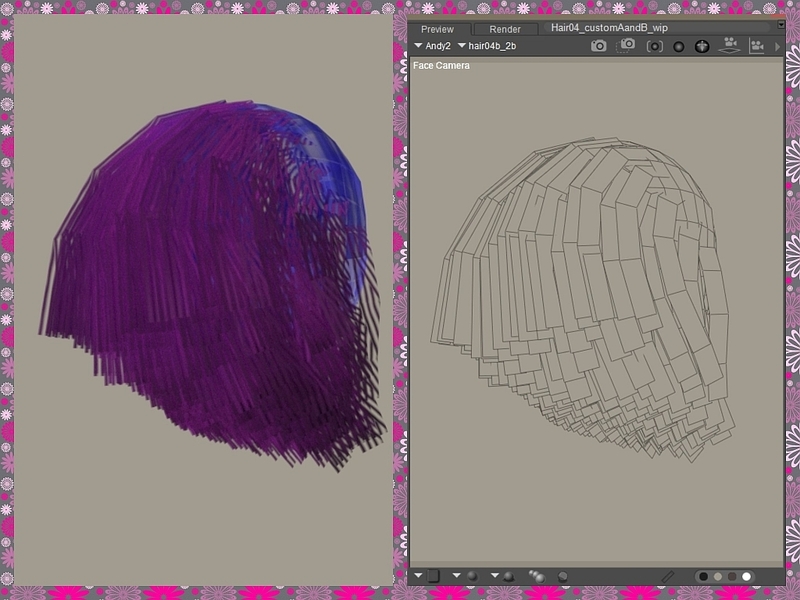 I have to adjust quite a number of things, including the subdivision of the scalp part. 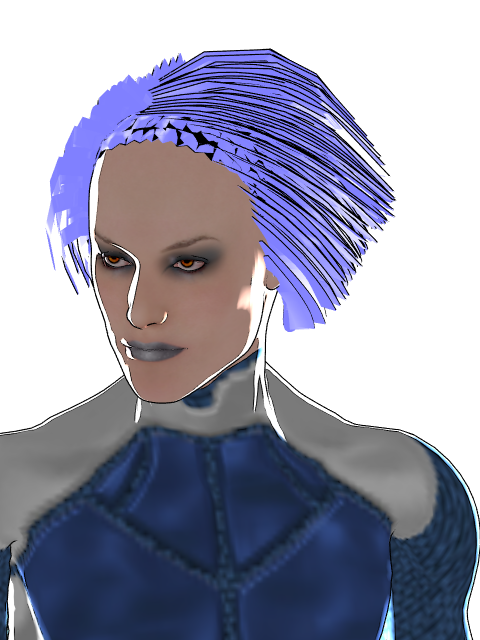 Note that the BB Hair Superfly shader works through the Poser Surface Node. 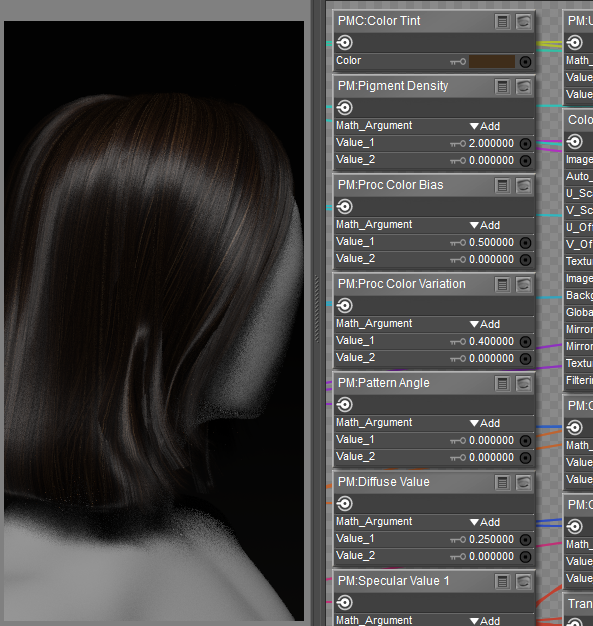 Meanwhile, here is my WIP for my own Cycles Surface shader for my Blender hair. I need to work more shine or gloss into the node structure. 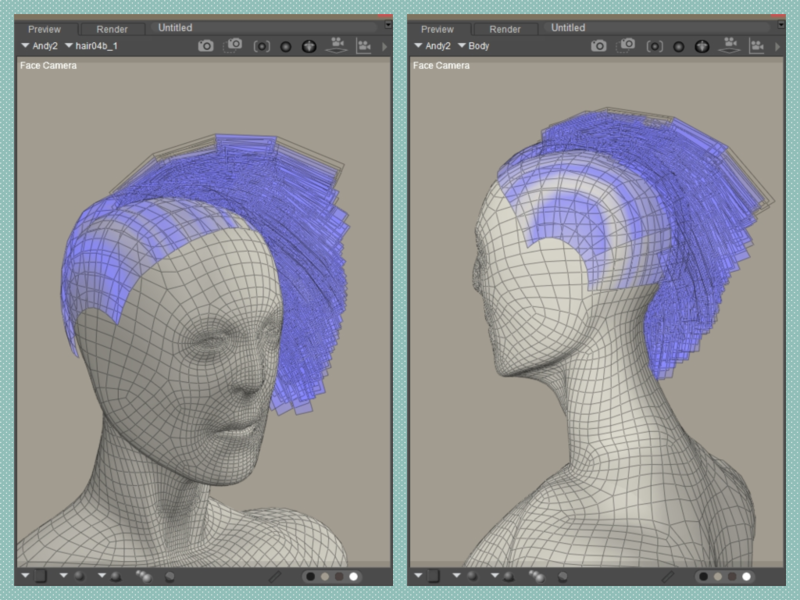 The various options in the Wave Texture node should be modified to match the geometry scale, while the rotation option of the Mapping node should be adjusted to suit the UV mapping of the hair strips. 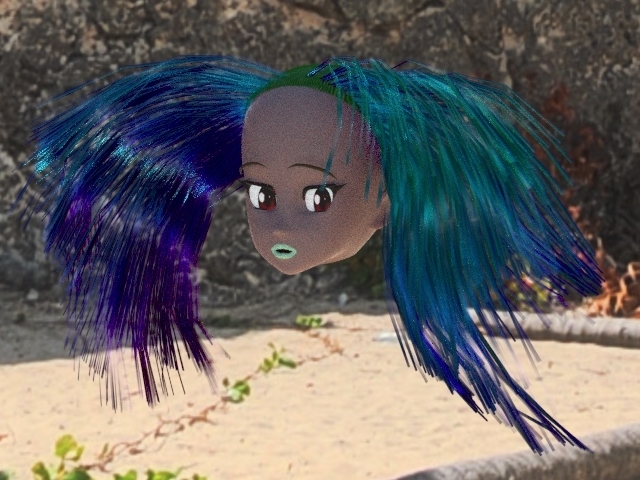 I have spent the last 2 hours attempting to render the hair mesh with the BB Superfly hair shader at higher resolution, but unfortunately, Poser crashes all the time. I am using a GTX 1080 nVidia graphics card, Intel Core i7-6700. with 32GB RAM. 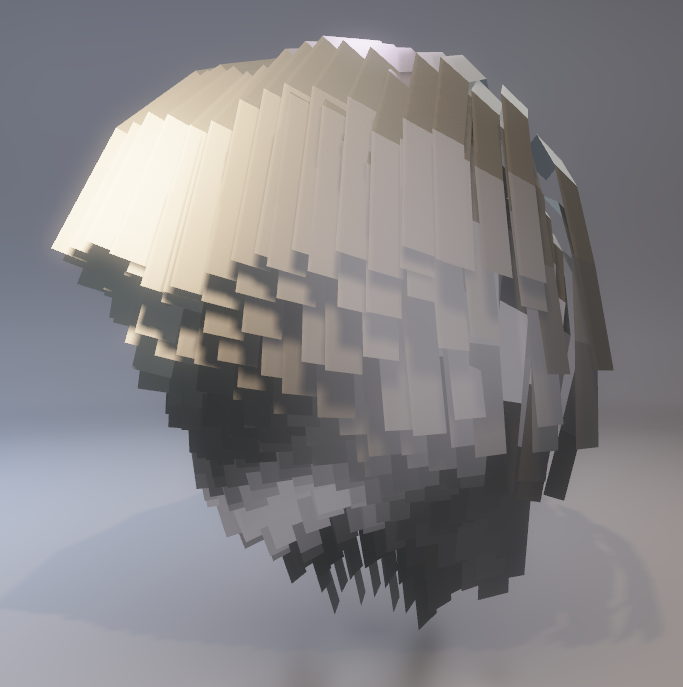 I don't know what's happening, but I am sorry I cannot show a better resolution render using SuperFly and the BB hair shader. 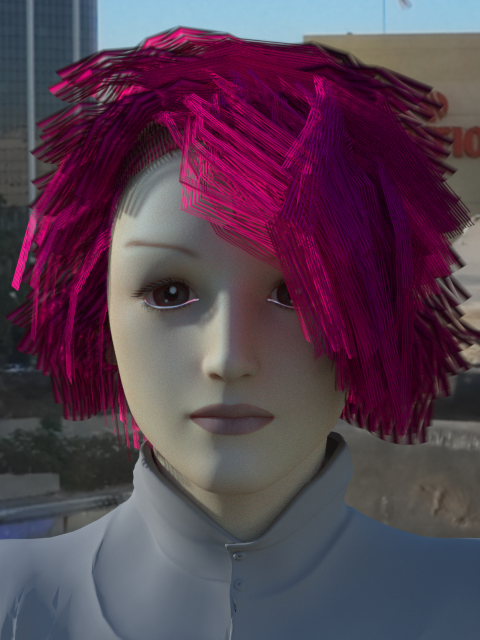 Yesterday, I created a fringe and added the fringe to the hair - it is now a composite of 6 props inside Poser, including a scalp and the fringe. Here are views showing the geometry and the rendered version. I am using Physical Surface base node for the hair props. 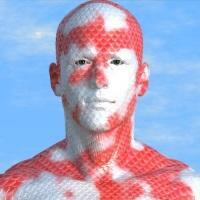 It appears that Renderosity web server i unable toaccept my images at this time (same thing over at my Gallery). I will update again some other time. I hope I can upload images now. 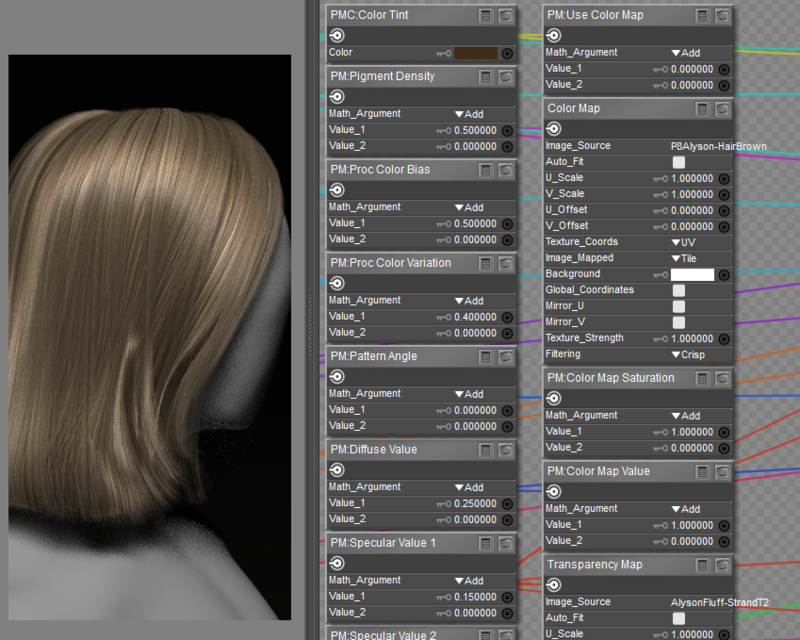 Here is the progress on hair creation from Blender 3D. 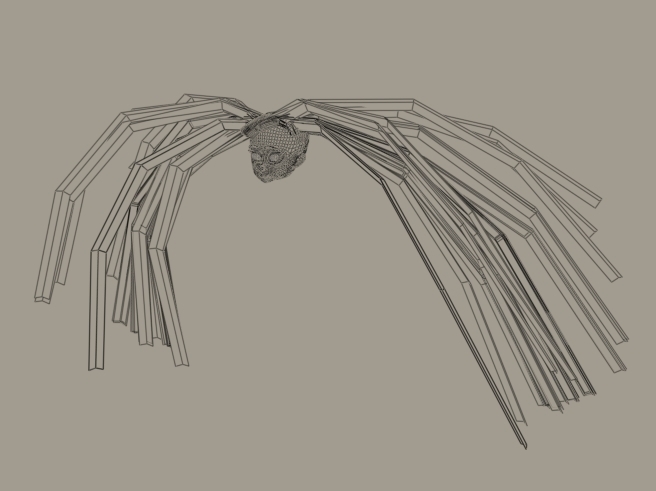 Fringe from hair generated using Blender 3D's particle emitter, converting the strand hair into mesh geometry, then modifying the geometry into stiprs of hair. 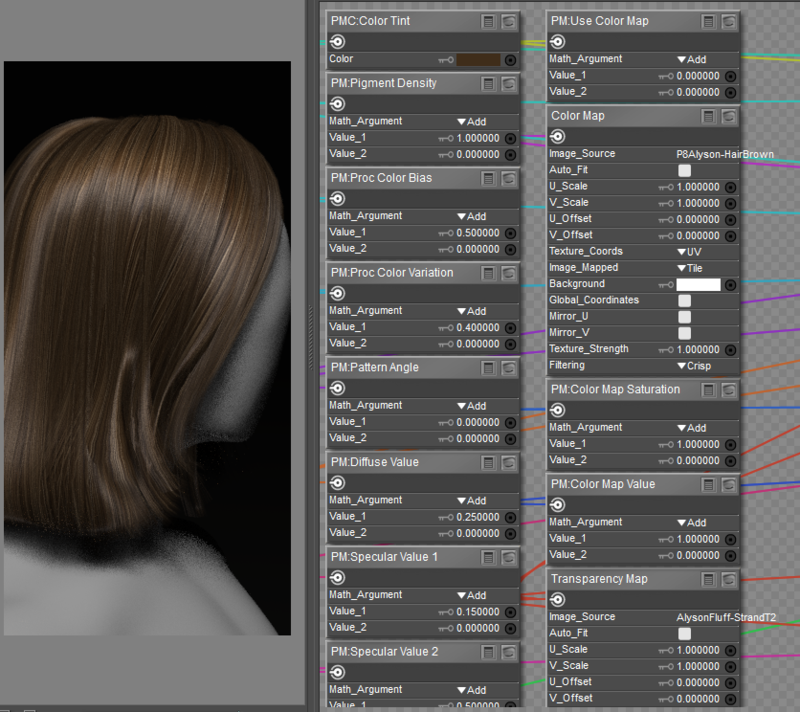 I used Physcial Surface node inside Poser Pro 11 to get the fake strand texturing for the hair geometry. 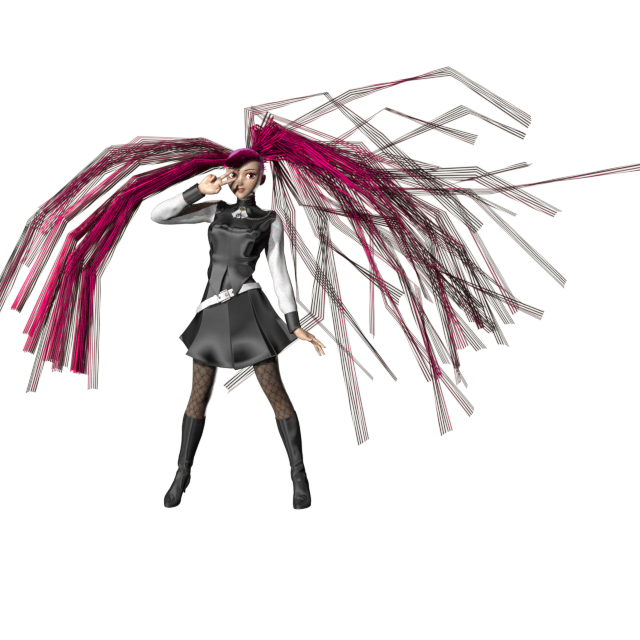 So I got curious and wondered: what if I made pseudo fibre mesh hair for use inside Poser ? 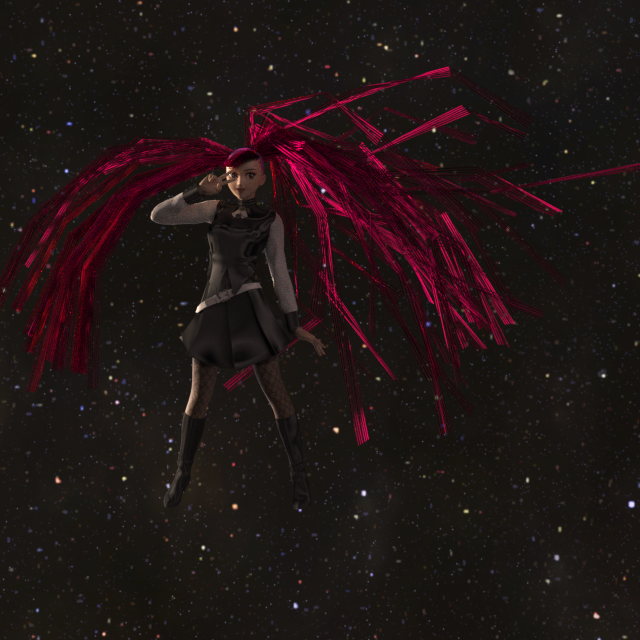 I would generate the particle emitter hair, convert to geometric mesh, and do not edit into strands. Just import into Poser for rendering. Well, my result is that it takes too long to render and is not feasible practically. Well, I suppose if you LIKE to WAIT what seems like a decade to complete a render, you could technically use this solution. I think I have better things to do with any time I save rendering. So - not going to go down this route. The tail on the figure's LEFT is the one which I made into a dynamic cloth. 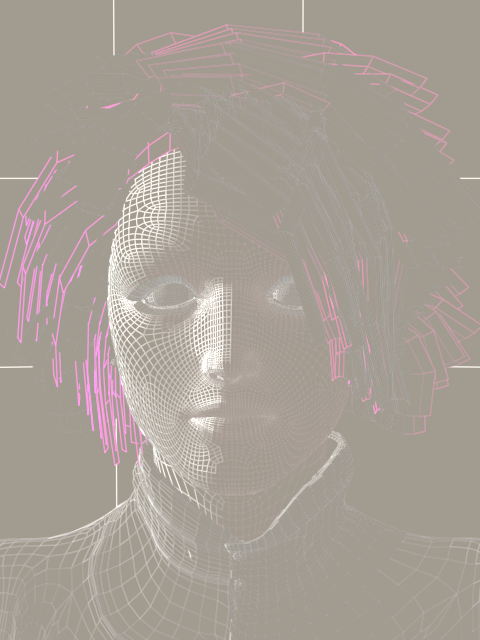 Fringe from hair generated using Blender 3D's particle emitter, converting the strand hair into mesh geometry, then modifying the geometry into stiprs of hair. I will write up my procedure at my deviantart website, in case anyone wants to try making hair the way I do.